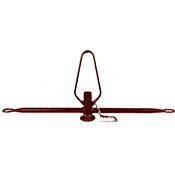 The Mole Trapeze with 1 1/8" Socket is used to "dead-hang" an overhead light from a rope. The rope threads through a wire yoke above the 1 1/8" socket which accepts the corresponding pin for the light to be suspended. The 32 3/4" (83 cm) wide "trapeze bar" features an eyelet at each end to which guy wires are affixed to prevent the light from turning once in place. It is designed to support large, heavy fixtures.